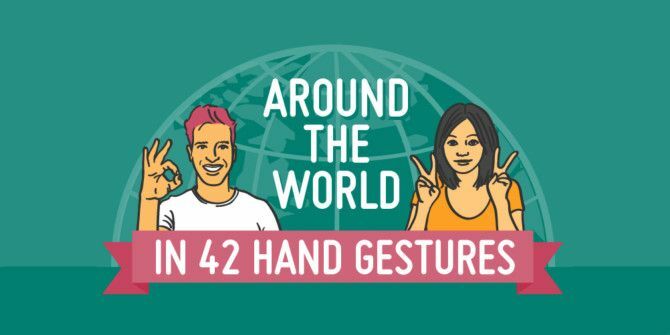 What Do Hand Gestures Mean in Different Parts of the World? Something as simple as holding your hand a certain way can speak volumes Make the Most of Your Body Language for Powerful Benefits Make the Most of Your Body Language for Powerful Benefits Body language is a non verbal communication we should all master for personal development. It can lead to better relationships and effective leadership. Read More . Holding up your index finger means something different from holding up your middle finger. As if it’s not all complicated enough, the meaning of hand gestures change in different parts of the world. Something that’s friendly in your country can be incredibly offensive in another. Don’t worry, though, because today we’re going to take a trip around the world to learn how your hand gestures will be interpreted many countries. And #7, tap your finger on your head is not just for Germany. Pretty much everyone in Europe uses it. I think much of Europe has variations of that one: certainly in the UK, tapping your finger against your temple wouldn't really mean much (maybe "think about it"), but holding it near your temple and making a circular anti-clockwise motion means "you're crazy". #6 for France means fear or sometimes being cold. Not worry or stress. The graphic would be more useful if it also told us what gestures NOT to use in what countries. A gesture might be perfectly OK to use in one country but have an obscene or very derogatory in another. "Stretch left hand behind your head and scratch your right ear = this is getting too complicated"